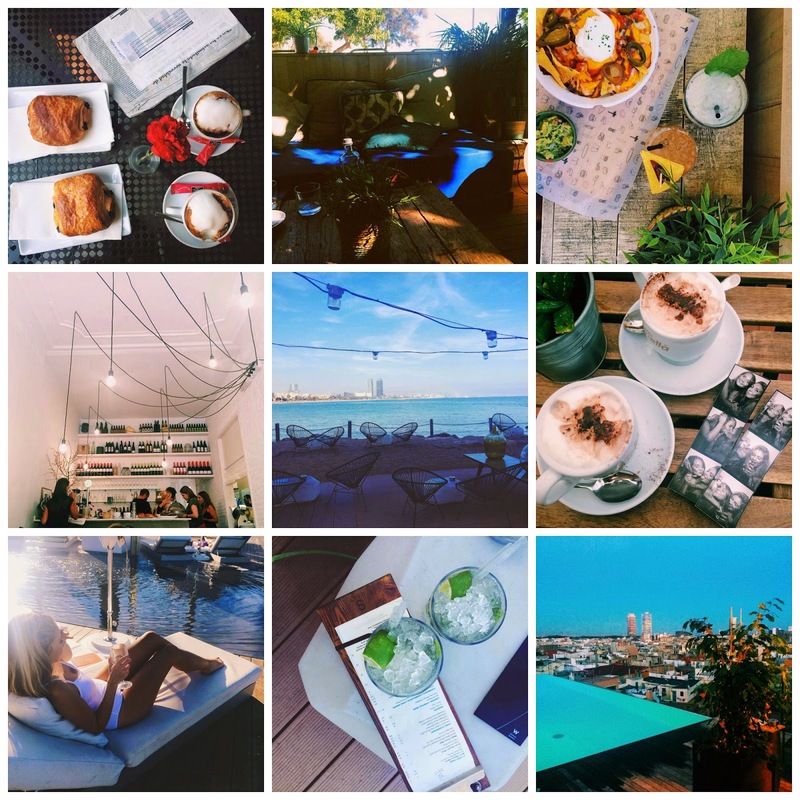 I recently had the best weekend city break in Barcelona. One of my best friends is out there working at the moment and the temptation to book a last minute flight finally got the better of me. So within a matter of days I was packed and sat in Liverpool airport at 5am ready to board and embark on a coffee and cocktail filled weekend! Its no secret that I have a love for coffee...and an even bigger love for photographing it. So in true best friend style, the first port of call when I got off the plane was the prettiest coffee shop in Placa Reial. The old square that the coffee shop was located in was amazing, and it was the perfect setting for a catch up! What we didn't realise until my last night, was that downstairs had the most incredible underground bar, which was filled with fairy lights and even had its own retro photo booth! The weather was hot for the entirety of the weekend, which meant we were able to fully commit to lounging by pools and increasing our cocktail and nacho consumption. I think one of my absolute favourite places I visited in that weekend had to be Surf House, which was a little cafe right on the beach front. Not only was the general vibe relaxed but the food was also amazing...and we soon learnt that it was the perfect spot for a hangover. In terms of touristy sightseeing stuff, the main highlight was Gaudi's Park Guell, which I was overwhelmed by the detail that went into its creation. There are definitely other famous sights that I want to explore in Barcelona...which only means I have an excuse to go back soon. I ended my weekend at Gran Hotel Sky Bar watching the sunset with a glass of Prosecco with a view over Barcelona. The rooftop bar also had an infinity pool - which I obviously steered clear of, as a combination of both alcohol and heels hasn't done me too many favours in the past with regards to standing upright! (I absolutely fell off my chair ten minutes into being there...the thought was there though). Out of all the places I have visited around the world, Barcelona is definitely up there with one of my favourites. Not only because it reunited me with my best friend, but because as I found out, no matter what street you went down - it was full of character, pretty balconies...and coffee shops. Gorgeous photos! I'm leaving for Barcelona next week and I can't wait for a coffee and cocktail filled week as well! Thanks for posting! !